Our goal is to provide quality art education, combining hands-on projects with art history instruction. Our classes promise a fun introduction to the basic elements of art, with an emphasis on imagination and creative problem solving. We have courses in drawing, painting, sculpture, ceramics, printmaking, and mixed-media. We offer Fall, Spring, and Summer sessions. During the Fall and Spring months, classes are held after school and on Saturdays. There is a variety of 2- to 4-week courses from which to choose, with new courses beginning each month. The summer session, during the months of June and July, consists of new week-long courses beginning each week. Participants in our summer session are encouraged to display their masterpieces in our annual Young at Art Exhibition in August. To enroll your child, please fill out the enrollment form and return it to Arts Visalia. Class sizes are limited with enrollment on a first-come first-served basis. To guarantee a place in a class, tuition must be paid at the time of enrollment. Tuition is non-refundable unless cancelled by the parent at least one week prior to the start of class. In the event a class is cancelled by Arts Visalia, a full refund will be given. All instructors and volunteers over 18, including parents who would like to be in the classroom, will be required to complete a livescan through Arts Visalia. This ensures the safety of our students. A livescan of $20.00 will be billed to the recipient. We may occasionally have class observers for educational purposes. Thank you for your understanding. We are pleased to announce that we are able to provide both full and partial scholarships to help cover tuition costs. Our goal is to ensure that every child has the opportunity to take a part in our art classes. If you know a child who would benefit from one of these scholarships, please contact us. Enrollment forms are available on our website and in-house. 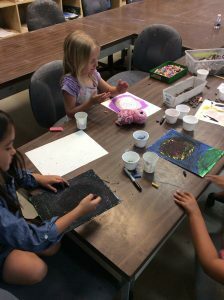 The hard work of the summer art classes culminates in our annual Young at Art exhibition, where we will feature artworks by each and every student who participates in the summer program. Held annually in August, the Young at Art exhibit is always the most joy-filled exhibit of the year as students, along with their families and friends, have the opportunity to see their artistic creations presented in the professional gallery setting. Arts Visalia received grant funding through the City of Visalia’s Measure N Grant and the Board of Supervisors Step-Up program. Through this funding we target participation of at-risk and underserved youth in our after school and summer art classes. 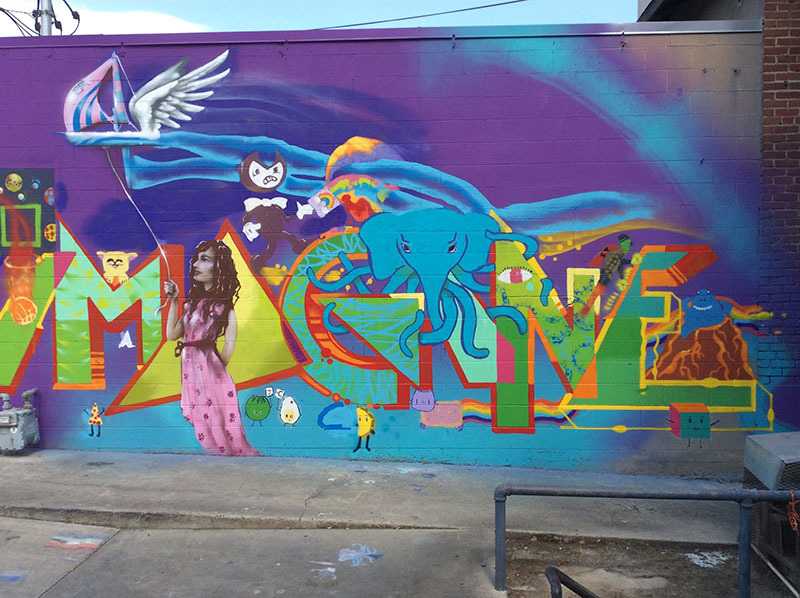 Working with at-risk and underserved students has enabled us to see how art impacts these children. Art has been considered a deterrent to negative behavior. Not only working on art projects, but also interacting with others in the classroom and with the instructor creates a positive atmosphere for these children. We decided to pay tribute to not only students that participate in our Young at Art Summer Program and Exhibition, but students that participate in Arts Visalia’s art classes year-round. In response to this need, we dedicated a permanent space for children’s artwork. After seeking the community’s input of the naming of the gallery space, the community chose the Young Imaginations Gallery. The Young Imaginations Gallery displays monthly artwork created from our 5-17 year old participants of our children’s classes. This is an exciting venture of continuing to stimulate creativity from our young generation. This space provides a safe place for children and families to visit during gallery hours. The generous supporters of Arts Visalia’s Youth Art Education programs.